Liverpool returned to winning ways on Saturday with a comfortable 3-0 win at home to Bournemouth. Two first half goals by Sadio Mane and Georginio Wijnaldum put the Kops on their way before Momo Salah added a third at the start of the second half. The victory means that Jurgen Klopp’s side keep up with Leaders Man City despite having played a game less. For City, they were the stand-out performers last weekend, drubbing Chelsea 6-0 at the Etihad. Sergio Aguero scored his second hat trick in three games while Raheem Sterling added a double with Ilkay Gundogan scoring the other. City are still top of the standings level on points with second placed Liverpool but with a superior goal difference. At Wembley Stadium, Tottenham Hotspurs scrapped to a 3-1 win over Leicester on Sunday. Davinson Sanchez opened the scoring three minutes past the half-hour mark, Christian Ericksen made it 2-0 halfway the second half and despite Jarmie Vardy reducing the deficit, Son Hueng Min sealed the points late on with the third. Arsenal and Man United were also victors in their respective fixtures with the Gunners overcoming Huddersfield Town 2-1 while United drubbed Fulham 3-0 at Craven Cottage. There were also victories for Cardiff who climbed out of the relegation zone, Watford and Burnely. Cardiff defeated Southampton 2-1 away from home, Watford were 1-0 winners over Everton at Vicarage Road while Burnley overcame Brighton 3-1 at the Anex. Despite a temptation to use City as my best 11, here are the players that stood out for me this past weekend in a 4:3:3 formation. The Frenchman made nine saves including one from the spot, against Leicester, who only managed to beat him once from 20 total shots. It has been a trying season for Arsenal’s youthful player but on Saturday away to Huddersfield Town, he showed glimpse of his talent, setting up Alexandre Lacazatte for what proved to be the winner. Sanchez scored the opener in Spurs’ 3-1 win over Leicester on Sunday. It was his first goal for Spurs in the Premier League. CB: Sol Bamba (Cardiff City). Yes he scored the first goal in Cardiff’s 2-1 win away to Southampton but Bamba stood out for me because of his defensive heroics on the day. The Ivorian center-back made a league high 4 blocks on Saturday. Watford produced a defensive masterclass in their 1-0 victory over Everton on Saturday and for me, Holebas stood out from the bunch. He also give his side the much needed width when required. Scored his first League goal of the season and also set up another as Liverpool defeated Bournemouth 3-0 on Saturday. MF: Paul Pogba (Man United). Pogba scored with both of his shots on target against Fulham, netting two of Man Utd’s three goals at Craven Cottage. MF: Ilkay Gundogan (Man City). As well as scoring Man City’s fourth against Chelsea, Gundogan created two goal-scoring chances for his teammates on the day that he bossed a midfield consisting of Ngolo Kante and pass-wizard Jorginho. FW: Anthony Martial (Man United). Martial was directly involved in two of Man Utd’s three goals against Fulham, scoring one and assisting another. FW: Sergio Aguero (Man City). 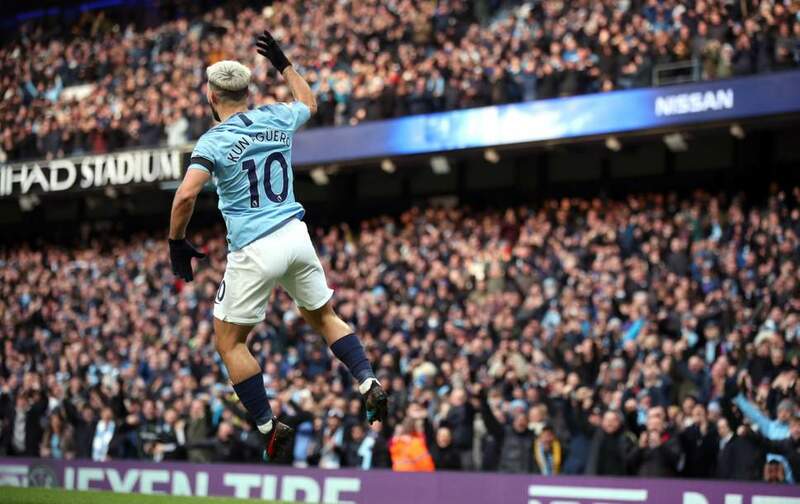 The Argentine striker scored with all three of his shots on target against Chelsea, netting his 11th career record equaling hat-trick in the Premier League. FW: Raheem Sterling (Man City). He may have scored only two goals but Sterling was a menace for Chelsea’s defence on Sunday. Involved in 4 of the six goals and schooling Ceaser Azipilicueta everytime the Englisman attacked the Chelsea captain.